We need helpers for various tasks, helping out with the sales tables, helping out with the BBQ, and more. To arrange for a task and schedule. Please contact Cathy Livingston: cathy.livingston@sympatico.ca, 613-928-2796. Begin Saturday, September 29 off with a McDelta Harvest Breakfast at the United Church starting at 8.00 am. Then take a tour of the Old Stone Mill, check out the local food vendors, view the blacksmith plying his trade, check out the many vendors and the car show in the Fairgrounds. Have an Old Fashioned Portrait taken using the green screen heritage photo booth in the Old Stone Mill. Lunch will be Chicken Pot Pie at St. Paul's Anglican Church or BBQed Hot Dogs at the Millcreek Scoops. Be sure to check out the bread making contest entries in the Old Stone Mill. There will be musical entertainment by Judi Longstreet and Run of the Mill in the Old Stone Mill and Texas Tuxedos at the Fairgrounds. The Fire Hall Museum will be open and Lower Beverley Lake Park has a 25 per cent discount on camping rates. Take a wagon ride for a tour of the village. End the day by enjoying the Harvest Festival Dance which will take place in the Agricultural Society Hall from 8 pm to 1 am. 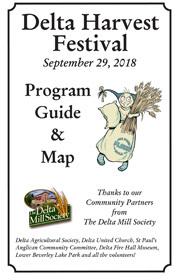 See what the Village of Delta has to offer. Make Delta your destination for the day!